Recently I watched a fascinating video entitled, Privileged Planet, based on a book by the same name. The book is the joint effort of Astronomer Guillermo Gonzalez, Assistant Professor of Astronomy at Iowa State University, and Jay Richards, Vice President and Senior Fellow of the Discovery Institute in Seattle. Both of these men were suspicious that natural selection could not account for the apparent design present in the universe and wrote the book based on one aspect of this suspicion. Lest some reading this think intelligent design is another angle to creationism, consider this. In answer to the question, “Is intelligent design the same as creationism?” the answer given is, “No. The theory of intelligent design is simply an effort to empirically detect whether the ‘apparent design’ in nature acknowledged by virtually all biologists is genuine design (the product of an intelligent cause) or is simply the product of an undirected process such as natural selection acting on random variations.” (source below) So, this book is the work of a scientist and a philosopher who are trying to draw rational conclusions from the data about the subject of origins. The book and video focus on twenty factors about the earth that make it uniquely able to sustain complex life as it does. For example, in our solar system, earth alone is in a position for complex life to exist. If the earth were closer to the sun, the gravitational pull would cause the earth to rotate more slowly, and eventually only once in each revolution (year). This would make life impossible on both sides. If it were further away, the earth would not be warm enough to sustain life. The inhabitable zone is further away from the sun than Venus, but closer than Mars. The liquid iron core gives the earth a magnetic field that shields us from cosmic radiation. The moon stabilizes earth’s 23.5º tilt which is needed for seasons and tempering the climate. The atmosphere is a protection from radiation, the correct combination of oxygen and nitrogen for liquid water to be in abundance, and perfect for life to continue. Of 70 bodies studied, only of earth can this be said. Further, these same factors make it possible to actually study and learn about our earth and other objects in space. In other words, the earth is both an ideal place for life to exist, and it is also an ideal place to observe and learn about the moon, the solar system, and the universe around us. Gonzalez began considering this idea when observing the 51 seconds of a total eclipse of the sun from a location in India. Though the moon is 400 times smaller than the sun, it ‘happens’ to be 400 times closer than the sun. Thus their relative sizes in the sky are almost identical. Because of this, we are able, during a solar eclipse, to observe the sun and other stars normally blotted out by the sun. Gonzalez studied 65 other bodies and concluded that on none of them would a total eclipse occur. If our atmosphere were not transparent, then only orbiting telescopes could observe the planets and stars. Of 70 heavenly bodies studied, only earth has a transparent atmosphere. Further, we live in the perfect place in the Milky Way, in a relatively uninhabited (with other stars) area. Were we closer to the center or further away from the center of the spiral, we could not see the constellations visible to us on a clear night. The chance of each of these factors being true they guessed at 1 out of 10, a very conservative estimate. However, for all twenty to be true in one planet is 1/10 times 1/10, etc. for twenty times or one in a trillion-trillionth chance. That isn’t very great!! Psalm 19 in the Bible begins, “The heavens declare the glory of God.” The Bible says that God made the earth for us to inhabit. 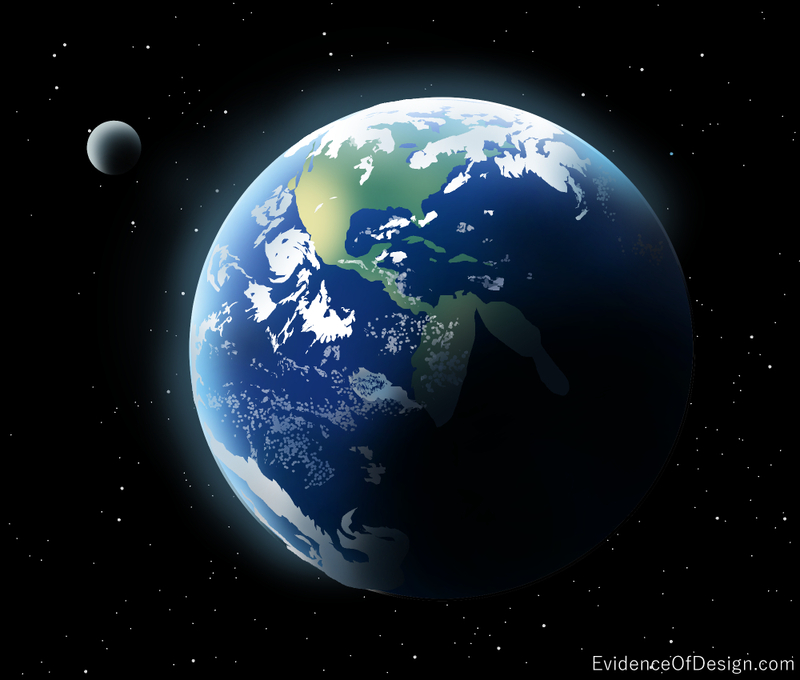 “The heaven, even the heavens, are the LORD’S: but the earth hath he given to the children of men.” (Psalm 115:16) The Privileged Planet hypothesis from intelligent design scientists could be improved by concluding that God not only made the world for us, but He also placed it in space in such a way that we could understand the vastness of His creation, be humbled, and glorify Him. design=make the plans before creating. intelligent design= intelligently make the plans before creating. thus intelligent design actually assumes more than creationism, which only assumes we have been created, and not that the creator was intelligent. 1/10 * 1/10 *1/10*…*1/10= 1/10^20 – yes a very small number. the entire Universe could be at least 10^23 to 10^26 times as large as the observable universe. This is a bigger number. that we have only observed a few million stars by eye and seen a couple hundred planets means it is probable that there are way way more than 10^20th planets out there, which means that it is very probable that we are not unique, and it is likely that another earth like planet exists, without the help of intelligent design. Regardless, this is not how probability works. Probability is about future states, and analyzing the number of outcomes. You can not gather information about a present state given probability. I watched a program that showed a few more things that had to be true for life to exist on earth. I have looked for it, but I haven’t been able to find the name of that program yet. At the conclusion of the show, the number was put on the screen that showed a rough guess at the probability for these things to be true. The word trillion filled the screen in small print. People may talk about darwin and the dinosaurs with a lot of confidence, but I think that He made the earth APPEAR old. I haven’t seen a live dinosaur yet. I just watched the video for a class I am taking called “Apologetics and Worldview.” The video was very eyeopening and I was intrigued to see the huge amounts of evidence leading to a conclusion of Intelligent Design. Though I wish they would carry their findings further and see the truth that God our creator has laid out for us.